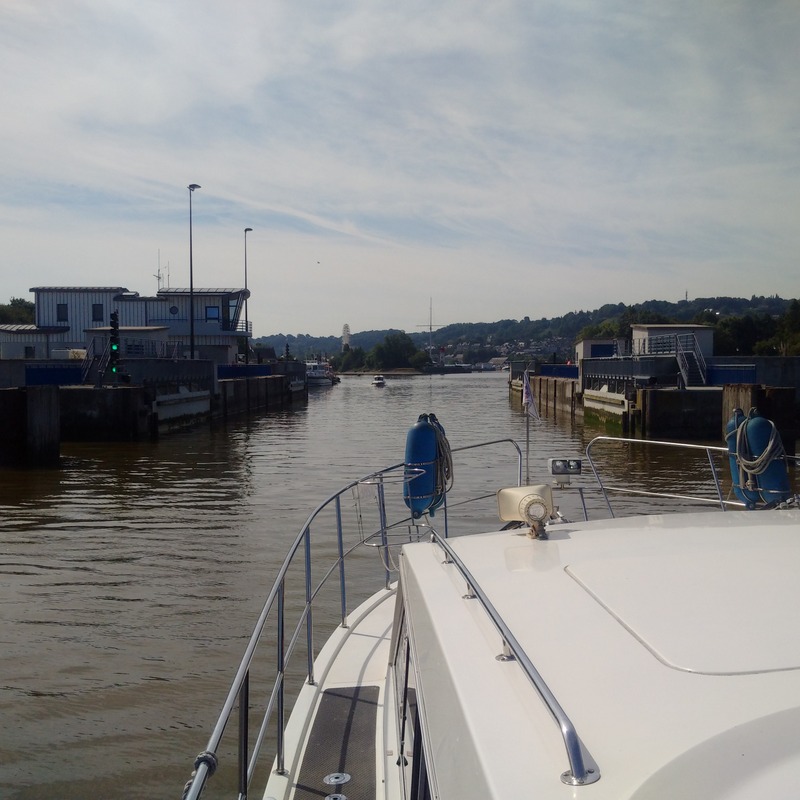 Another good cruise from Deauville to Honfleur on an even warmer and sunnier day, judging the gate opening times and tides perfectly at each end and arriving just in time for the bridge lift into the inner Vieux harbour. It was a late decision to leave Deauville today for the cruise to Honfleur and this meant lots of preparations under pressure which continued into this morning, first thing. However I overcame the difficulties, worked out exactly when to leave and how fast we should go in order to arrive at Honfleur after the sea locks had changed to ‘free-flow’ and in time for the last bridge lift before lunch and into the historic Vieux harbour in the very centre of this delightful place. 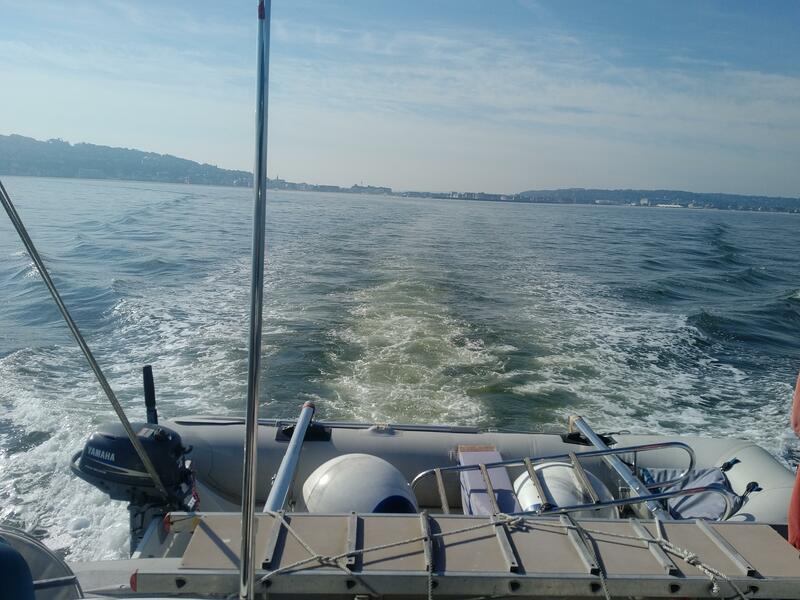 The main problem that I faced was in calculating the high and low water times of both Deauville and Honfleur by their differences from the standard port, Le Havre. Depending upon whether the date is close to Neap or Spring tides, the differences vary and I was getting confused by conflicting information I was receiving. Furthermore, just like the Solent, there is a double high tide in these parts to add to the confusion. 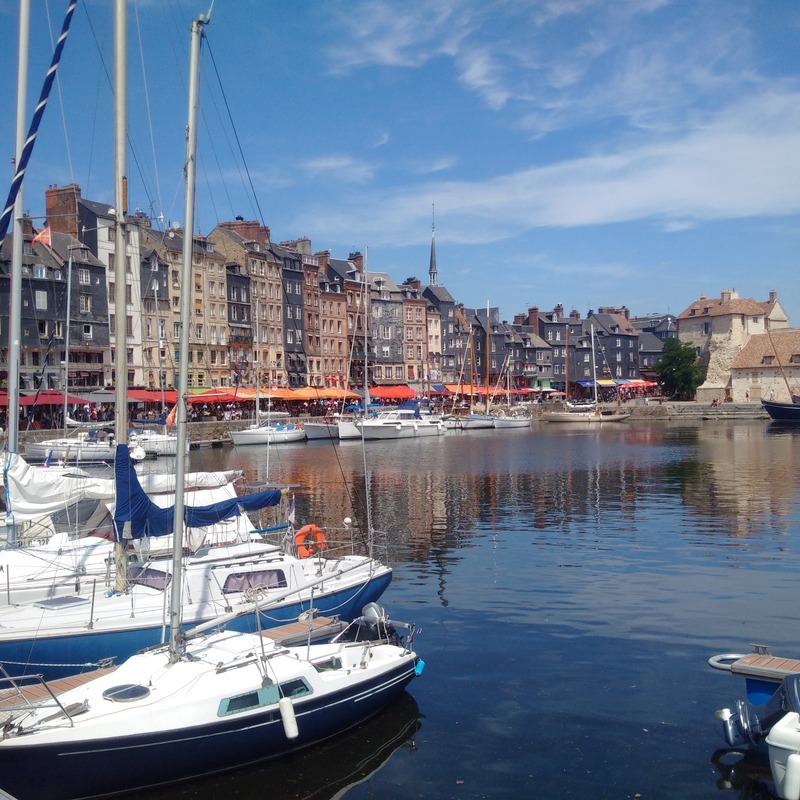 I was reasonably confident today that High Tide at Honfleur was around 10.45 UTC which meant 12.45 French summer time and so, given the today barrier was normally open around 2 hours before and after, I reckoned that we needed to leave as soon as possible from Deauville. Here the gates were open 2.5hrs before and after and by my calculations that meant we could exit the port around 9.30am LT. First thing this morning, I noticed the harbour office open and so made it my business to go and ask them (all in French) what time the gates opened this morning and it was 9.20am, just 10mins out from my calculation! We were right ready for that and were just one of two boats exiting today in stark contrast to yesterday. This extra few minutes let me slow down to a more economical speed and I arrived at Honfleur at exactly the right time and so caught the open sluices and then the last of the bridge openings before the lunchtime break to arrive at the very attractive Vieux harbour where we could raft up against two Dutch boats and stay in the very centre of this great historic city. It was another very hot and sunny day and so I switched the air-conditioning on, put up the sun canopy and then rested for ages reading my book on ‘Pegasus Bridge’ and relaxing. It had been a very smooth passage and I had judged everything correctly to arrive at a nice mooring and I was very pleased. Later on, when it was cooler, we ventured out for a walk around this stunning historical and artistic place, with its countless restaurants and tourist attractions that made us feel very fortunate to be here. We ended the day very happy but also very tired and looking forward to some rest and recuperation after two successive days’ cruising.